Review: Audible Love • Tips, Trends & News in 60 Seconds or Less! Set in a boarding school for the arts called Trudale in Hollywood, Audible Love by Maggie Dallen is told in the perspectives of Avery and Seth, two students from different worlds paired up for a class project. While Avery wants an attempt at a normal life despite being a big name celebrity, Seth just wants to get through the last year of high school as a scholarship student. Maggie Dallen’s novel is a little hard to get into. Both Avery and Seth’s narratives frequently came off as rambling. Much of the novel, in addition to the narration, was focused on their interactions with each other as they navigated the project. I loved reading their banter as they discovered how their their impressions of each other changed as they took the time to know each other as people. But while I enjoyed the story overall, I wanted more from the plot and the side characters. 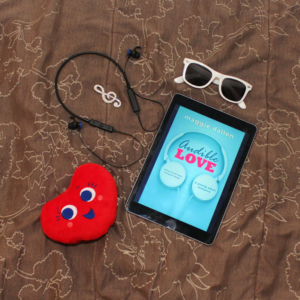 Audible Love is a cute and quick read, perfect for those who enjoy a good romance set in Hollywood.